I read in the Brisbane Times today that some poor Japanese women apparently bought “poodles” from a company called “Poodles as Pets”. As you can see from my cartoon, it was reported that the “poodles” were in fact sheep, shorn to look like poodles. Alas, it was not the Japanese women who were fleeced, it was the unsuspecting Western public. 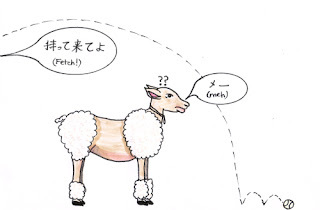 Apparently Hokkaido is full of sheep, and there is no record of a company called Poodles as Pets. Darn. It was such a funny story. I still like my cartoon. Snopes draws a similarity between the sheep/poodle story and the “Mexican dog” story. Of course, the Mexican dog is actually a rat. And, of course, the story is an urban legend. However, a few years back I took some English friends up to Healesville Sanctuary (an Australian wildlife sanctuary just out of Melbourne). We looked at wallabies, wombats, Tasmanian devils. About half way through our circuit, we came upon some American tourists photographing a small “native animal” on the path with coos of delight. “Should I take a photo?” asked my English friend, looking at me for guidance. I shook my head quietly, and drew her and her husband away. “I don’t know quite how to tell those tourists there, but they are taking pictures of a rat.” We couldn’t think of a way to break it gently without crushing the enthusiasm of the poor tourists. Mixing up a rat and a kangaroo rat is far more understandable than mixing up a rat and a dog or a sheep and a dog. This entry was written by Legal Eagle, posted on at 10:18 pm, filed under Fark!. Bookmark the permalink. Follow any comments here with the RSS feed for this post. Post a comment or leave a trackback: Trackback URL.